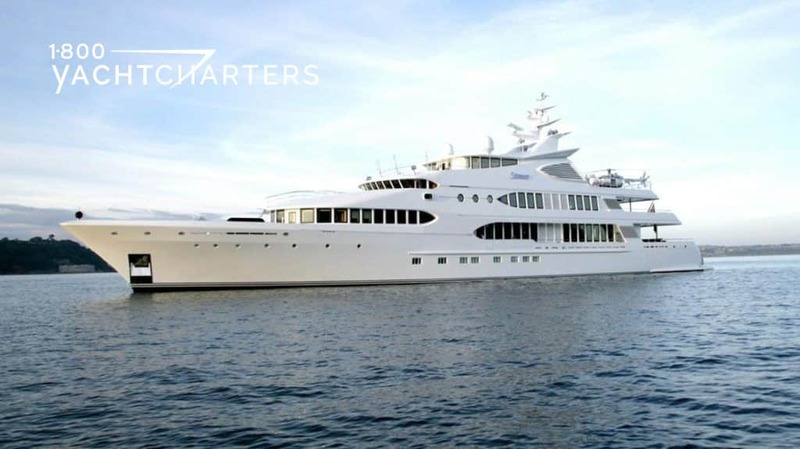 Luxury motor yacht MARAYA is one of the latest superyachts launched by builder CRN. She is a 54 meter steel and aluminum mega yacht whose exterior lines are by Zuccon International Project, and her naval architecture is by CRN Engineering. The name of luxury charter yacht MARAYA translates as “many mirrors” in Arabic, and gives a clue to a central motif of the interior décor. Mirrored surfaces are used to bounce light around and illuminate potentially dark areas of the yacht and heighten ceilings. 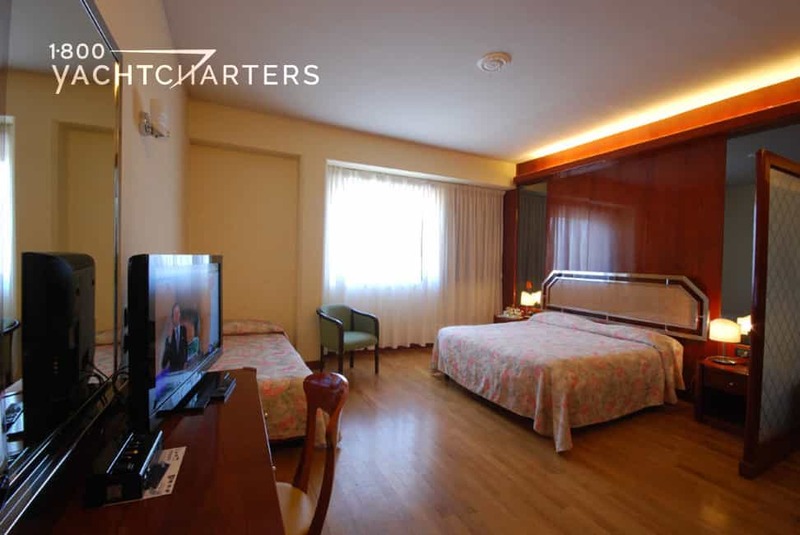 In the master suite, this extends to using “magic mirrors” to disguise the 42 inch plasma TV in the cabin and another screen in the bathroom above the central egg-shaped bathtub. This spectacular superyacht offers the very latest innovations in technology along with the rich and luxurious comforts expected from a charter vessel and an abundance of both internal and external spaces for her guests to escape, relax, and fully enjoy their freedom onboard. The yacht’s contemporary styling and crisp minimal interior designs by “Claude Misser” present guests with elegant curves and strong vertical lines combined with exquisite materials and countless refined finishing touches. American walnut, the principal wood used for paneling, is married with a creamy beige travertine marble sole in the main salon and gay pietra Serena marble in the owner’s bathroom. If this new yacht’s interior volume belies her overall length, room has been found for a treadmill in the small lobby at the top of the stairwell. An awning housed inside the radar arch extends to completely cover the open aft deck. The sundeck is designed for use as a touch-and-go helipad for aircraft up to 1.6 tons and also for stowing jet bikes. 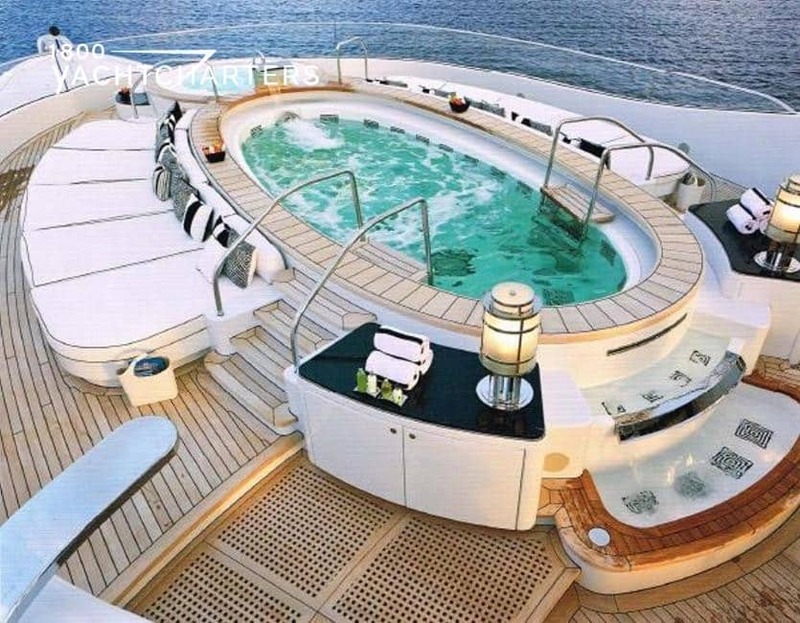 There is a playroom on the yacht, and it has sliding glass doors that open onto a swim platform that folds down from the stern bulwark. The private balcony in the forward master suite folds down from the hull structure, which extends the size of the platform over the water. To allow natural light to enter the cabin, two glass windows have been fitted into the teak floor. These are protected with matching teak covers when the balcony is in use. 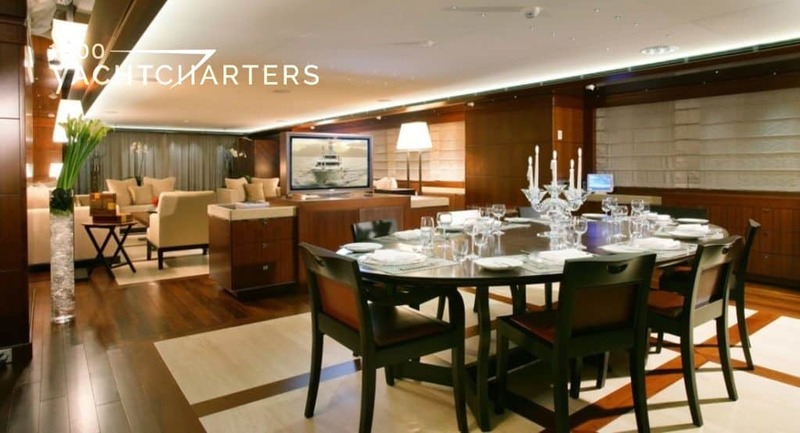 The new vessel’s accommodations layout features cabins for a total of 12 guests in the master suite on the main deck, a VIP cabin on the upper deck, and two twin and two double cabins on the lower deck. The main salon and dining room form an open space of some 100 square meters. Heads turn as this new CRN superyacht delivers Caribbean yacht charters or motors by in the Mediterranean luxury yacht charter marketplace. 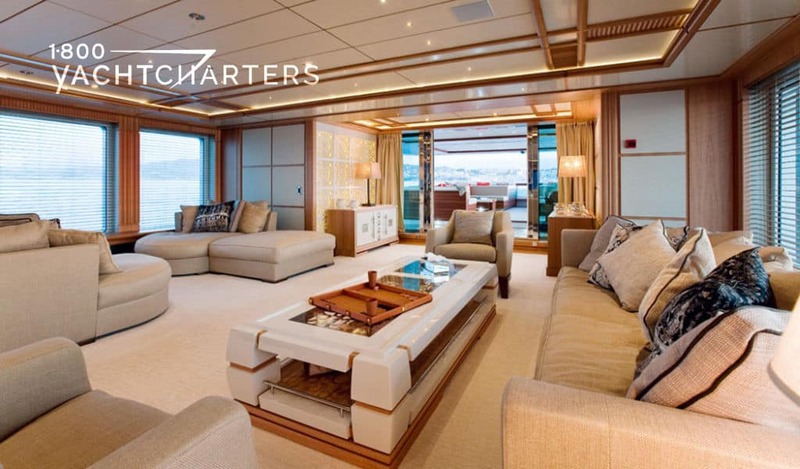 You can regularly see her cruising along the French Riviera and along the Amalfi coast of Italy, and at anchor for static yacht charters at both the annual MIPIM event in Cannes and the Formula F-1 Monaco Grand Prix.